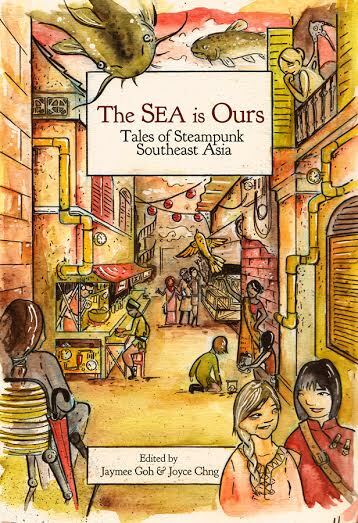 After a successful IndieGoGo campaign, Jaymee Goh and Joyce Chng’s collection, The SEA is Ours: Tales of Steampunk Southeast Asia, is available for purchase on Amazon. With steampunk stories set in Singapore, Thailand, Vietnam, Indonesia, and the Philippines, The SEA Is Ours from Rosarium Publishing features a blend of previously published writers and upcoming names. The stories in this collection merge technological wonder with the everyday. Children upgrade their fighting spiders with armor, and toymakers create punchcard-driven marionettes. Large fish lumber across the skies, while boat people find a new home on the edge of a different dimension. Technology and tradition meld as the people adapt to the changing forces of their world. It is Southeast Asian not only in name but in essence, with 11 of its 12 writers being Southeast Asian or of Southeast Asian descent. Both editors have long been involved in speculative fiction. Joyce Chng is the author of several urban fantasy and Young Adult novels written from a Singaporean perspective. Her fiction has been published in such publications as Crossed Genres, The Apex Book of World SF II, and The Alchemy Press Book of Urban Mythic. She co-edited The Ayam Curtain, a Singaporean anthology of sf/f micro fiction. She blogs at A Wolf’s Tale. Jaymee Goh, currently a PhD Candidate at the University of California, Riverside, has published short fiction and poetry, including a series of short stories set in a re-imagined Malaysia uncolonized by the West. Her fiction has appeared in Expanded Horizons and Crossed Genres, and in steampunk venues such as the Steam-Powered Series and Steampunk World. She has been quoted in Jeff and Ann Vandermeer’s Steampunk II: Steampunk Reloaded, as well as The Steampunk Bible, and has written steampunk-related non-fiction in The WisCon Chronicles 5 & 6 and Steampunk III: Steampunk Revolution. Her blog, Silver Goggles, tackles postcolonialism and racism in the various forms of steampunk. Rosarium Publishing made a splash in speculative fiction with its 2013 anthology Mothership: Tales of Afrofuturism and Beyond. Since then it has published several ongoing comic titles such as Kid Code by graphic arts professor John Jennings, DayBlack by tattoo artist Keef Cross, and The Little Red Fish by designer Bizhan Khodabandeh. Its oeuvre includes young adult comic Malice in Ovenland by Micheline Hess, adult graphic memoir Jennifer’s Journal by Jennifer Cruté, and satirical novel Koontown Killing Kaper by founder Bill Campbell. Its most recent anthology release was Stories for Chip: A Tribute to Samuel R. Delany, which received high critical praise. This entry was posted in Like Show Business and tagged Jaymee Goh, Joyce Ching, Rosarium Publishing, steampunk by Mike Glyer. Bookmark the permalink. Vasha: Thanks for catching that. While we know I am a bad copyeditor, this illustrates one of the causes — I am one of those readers who pays most attention to the beginnings and endings of a word. Here, I saw what I expected to see in the press release, rather than the actual spelling, and ended up adding a superfluous “i” when I typed the post.